Welcome to the September Dishing It Up Recipe Hop Giveaway! 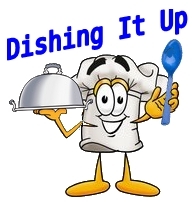 Dishing It Up is brought to you by Dearly Domestic, Deals From MS Do, Pary Moppins, Saving Myself Silly, and Thrifty Texas Penny. This month we are helping you ease into the school year by giving you some crock pot recipe ideas. My Crock Pot is one of those kitchen gadgets that I could not live without. Few items in my house save me as much time and energy as my Crock Pot does. This week, my contribution is Pasta Sauce in the Crock Pot.